The folks at the National Right to Work have put together this video emphasizing the Obama White House's unnaturally close relationship with big labor's bosses. This is a clear violation of the President's campaign promise to keep lobbyists out of positions of influence in his administration. Of course, he's already broken that promise many times over. Posted by John M. Allison III : Post Link --> 6:15 PM 0 Comments - Share Yours! Posted by kmorrison : Post Link --> 12:51 PM 0 Comments - Share Yours! Red Country is reporting that "US Senatorial candidate Marco Rubio has surpassed Governor Charlie Crist in today's Quinnipiac poll (47-44). What is surprising to me is, that in such a short period of time, Rubio has done what many thought to be the unthinkable - sprint past Crist!" . . .
To add a little salt to the wound, Crist has just announced that he reported $2 million in the last quarter--far less than what he reported in prior quarters. Rubio's fundraising has been climbing steadily. Yet, rumor has it that Rubio will post a very impressive number that is comparable to what Crist just announced. . . . Tags: 2010 Election, Charlie Crist, Florida, Marco Rubio, Republicans, US Senate To share or post to your site, click on "Post Link". Please mention / link to America's Best Choice. Thanks! Posted by Bill Smith : Post Link --> 9:55 PM 0 Comments - Share Yours! Competitive Enterprise Institute: Washington, D.C., January 20, 2010—One year ago today, Barack Obama took the oath of office as President of the United States. Since then, he and his appointees have had the opportunity to begin implementing their policy agenda, with notable results throughout the federal government’s departments and agencies. The analysts of the Competitive Enterprise Institute have assessed the administration’s first-year performance and assigned grades accordingly. Posted by Bill Smith : Post Link --> 10:51 AM 0 Comments - Share Yours! by Chelsea Schilling, WorldNetDaily: Rep. Barney Frank has confirmed that Sen. Chuck Schumer "is working on legislation regarding voting," lending weight to reports that Democrats are planning to implement a federal mandate to automatically register millions of people to vote. As WND reported, Wall Street Journal reporter and political commentator John Fund has been warning that Democrats have a plan to propose universal voter-registration legislation – within months or possibly even weeks. . . .Fund argues that universal-registration plans involve the use of a wide range of government lists and databases to automatically add people to voter registration rolls. He discusses the topic in his November 2009 book, "How the Obama Administration Threatens to Undermine Our Elections." Automatic Registration: Automatic registration shifts the burden of registration from voters to government and eliminates the need to rely on independent, third-party voter registration organizations to sign up voters. Such a registration system will help states efficiently identify eligible voters from other government databases and add those names to their registration rolls. Voters can opt out if they prefer not to be registered, but for those who want to be included on the rolls, this system will continually update the names of eligible voters, eliminating the last minute deluge of registration applications just before registration deadlines. Following the hearing, Schumer argued that as many as 7 million registered voters were prevented or discouraged from casting ballots in the 2008 election. "Each one alone may not seem like an egregious violation, but put together, you get massive disenfranchisement," Schumer said in a statement. "This is unacceptable and undemocratic." . . .
"The idea, embraced by Barack Obama when he was a presidential candidate, is to shift responsibility for registering to vote from the individual to the federal government," Fund writes in his book. "All eligible citizens would automatically be registered to vote, which existing lists such as DMV records, income-tax returns, welfare rolls and unemployment lists being used to enroll everyone. Once registered, individuals would stay on the federal rolls, even if they move to another state or district." Fund warns that the government databases contain names of non-citizens, mentally incompetent individuals and felons – factors that would usually disqualify a person from voting in most states. He also notes that many people own property in more than one location and pay taxes to numerous government entities. "[U]niversal voter registration would automatically register them in more than one location, allowing them to vote more than once – either in person or by mail," Fund explains. He said the plan would destroy the integrity of the registration process, much as widespread registration drives by the Association of Community Organizations for Reform Now, or ACORN, were reportedly rife with criminal actions, including people registered multiple times under fraudulent names and addresses. In the 2008 election, ACORN's practices led to investigation in more than a dozen states. "Now they will sell this very cleverly," Fund explained. "They will say, well, OK, ACORN did have some problems with voter registration. We shouldn't have these third-party rogue groups out there. So, let's put ACORN out of business, and let's register everybody." Numerous left-leaning groups and publications have been openly calling for universal-voter registration in recent years. In its April, 13, 2009, article by Eliza Newlin Carney, the National Journal reported that Schumer "plans to introduce a bill to revamp the voter registration system later this year." "Democrats believe it is too hard for people to register and vote; Republicans believe it is too easy to register and vote fraudulently," Schumer said. "There may be a way to solve both problems simultaneously through technology and forge a better bipartisan solution." Even Secretary of State Hillary Clinton has advocated for automatic voter registration. "A system of automatic registration, in which the government bears more responsibility for assembling accurate and secure lists of eligible voters, is a necessary reform," then-Sen. Clinton told the New York Times in November 2008. In addition to statements made by Frank and Fund, a congressional staffer confirmed Schumer's involvement. "What we know from statements from advocacy groups that support universal-voter registration is that they have been working with Sen. Schumer's office since approximately last spring to create a bill," the staffer told WND. "We don't know exactly when he will introduce it, but it has been predicted to be introduced in the near future for several months now. Schumer definitely has been, and seems to be, the point person on this." Posted by Bill Smith : Post Link --> 7:49 PM 0 Comments - Share Yours! by Chris Slavens: . . . Young, uninformed voters who jumped on the Obama bandwagon have moved on to the next social trend, some regretting their votes upon finding that the president’s version of change is not what they expected. Tea parties organized on a grass roots level are gaining widespread popularity and momentum among the working and middle classes, despite an intense media propaganda effort to portray the movement as marginal. But while Obama’s plummeting approval ratings reflect an increasingly disillusioned citizenry, his position is safe for the moment. The same cannot be said for House Democrats. They will reap the consequences of President Obama’s policies, and their roles in a legislative experiment gone wrong. The House of Representatives was designed to reflect shifting public opinion. Today’s problem is that opinion is shifting, and House Democrats aren’t reflecting. 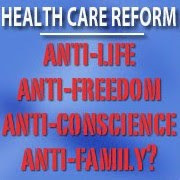 They continue to pursue federal health care reform that is unnecessary, unpopular, and unconstitutional. They ignore, or support, the president’s alarming use of policy “czars,” sidestepping Congress and the voters in an unprecedented increase of the Executive Branch’s power. If Democrats refuse to address the problems in the Obama administration, and continue to disparage the legitimate dissent of concerned citizens, they will be dealt a severe blow in the coming 2010 election, which could result in a lost Democratic majority and lame duck presidency only halfway through Obama’s first (and possibly last) term. . . . [Full Article] Chris Slaven, former member of the Wilmington News Journal’s Community Advisory Board, is a guest Liberty Features Syndicated writer for Americans for Limited Government. Tags: 2010 Elections, Democrats To share or post to your site, click on "Post Link". Please mention / link to America's Best Choice. Thanks! America Now Only the Land of the "Mostly Free"
by Amanda J. Reinecker: The Heritage Foundation has released our 2010 Index of Economic Freedom, and the results are alarming if not terribly surprising: America is no longer ranked among the world’s free economies. Instead, for the first time, America ranks as only "mostly free" -- behind countries like Canada, Ireland and Switzerland. The Index, published for the past 16 years as a joint project with The Wall Street Journal, analyzes the economic freedom of 179 countries and bases their scores on three categories: government burdens upon businesses and entrepreneurs; intrusiveness of government; and fundamental societal characteristics that support today's most prosperous economies. Given the past year, it should come as no surprise that the United States' ranking has declined. After all, government spending has exploded and intrusion into the economy has increased, yet our government continues to raise its debt ceiling to allow for spending package after spending package. The drop in rankings is notable as it comes in the same week that marks the one-year anniversary of President Barack Obama's inauguration. By any standard, Americans' overall wealth and prosperity has continued to decline...unemployment has skyrocketed and shows no signs of abating, government spending and debt are at unprecedented levels during peacetime, and our elected officials seem determined not only to ignore these alarm bells but to pursue policies...that will cause entrepreneurs to stay on the sidelines rather than take the risks that have led the United States out of previous recessions. Americans are not happy about this. More and more of them are voicing their disapproval of big-government policies, which give way to more taxes and less freedom. On Tuesday, many of these Americans made their message loud and clear. Note as defined by the report, "Economic freedom is the fundamental right of every human to control his or her own labor and property. In an economically free society, individuals are free to work, produce, consume, and invest in any way they please, with that freedom both protected by the state and unconstrained by the state. 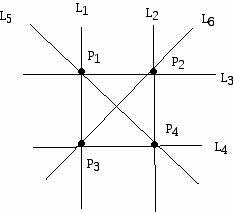 In economically free societies, governments allow labor, capital and goods to move freely, and refrain from coercion or constraint of liberty beyond the extent necessary to protect and maintain liberty itself." Posted by Bill Smith : Post Link --> 11:40 PM 0 Comments - Share Yours! Before addressing the word TRILLION, let's look at the word BILLION. think about how you want the politicians spending YOUR grandchildren's tax money. Let's put the word BILLION into perspective. Pre-the Obama Administration, spending a billion dollars was only 8 hours and 20 minutes ago. 250 BILLION DOLLARS to rebuild New Orleans. Each of the 484,674 residents of New Orleans (every man, woman and child) gets $516,528. Or, each one of the 188,251 homes in New Orleans, your home gets $1,329,787. Or, each family of four gets $2,066,012. Congress was already overspending, but now they are doing so exponentially! Now we spending a billion dollars about every 5 minutes. The total INTEREST PAID on the National Debt since 1988 was $7,393 billion ($7.4 trillion). The National Debt itself is projected to grow to $19,224 billion by the year 2019. There were very few taxes 100 years ago. Our nation was the most prosperous in the world. Are American voters asleep at the switch? Francis Rice, Chairman, National Black Republican Association: As we honor the legacy of Dr. Martin Luther King, Jr., let us pause to reflect on who he was and why his struggle to obtain civil rights for black Americans was necessary. First, Dr. King was a Republican until the day he died because he knew that the Republican Party, from its founding in 1854 as the anti-slavery party, championed freedom and civil rights for blacks. For details on the history of civil rights, see the NBRA Civil Rights Newsletter posted on the NBRA's website. 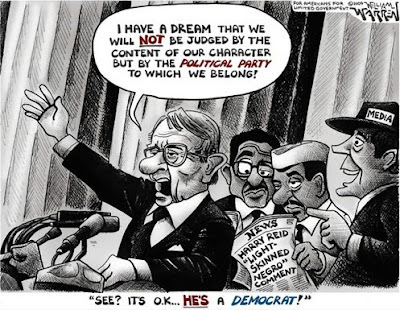 Second, the nemesis of Dr. King's valiant and historic campaign to end discrimination and gain equality for blacks was the Democratic Party, the party of slavery, segregation and the Ku Klux Klan. Led by former Klansman [Senator, WV] Robert Byrd, Democrats launched a despicable crusade to smear and undermine Dr. King. This relentless disparagement of Dr. King resulted in his being physically assaulted and ultimately to his tragic death. The trigger for this unsavory wiretapping was apparently Dr. Kings' criticism of President Kennedy for ignoring civil rights issues, according to the author David Garrow in his book, "Bearing the Cross". As was pointed out in the book by Wayne Perryman: "Blacks, Whites and Racist Democrats," Kennedy voted against the 1957 Civil Rights Act while he was a senator. After Kennedy became president, he was opposed to the 1963 March on Washington by Dr. King. Posted by Bill Smith : Post Link --> 3:50 PM 1 Comments - Share Yours! Posted by Bill Smith : Post Link --> 10:18 AM 0 Comments - Share Yours! "Republican activists in Gov. Charlie Crist’s home county voted 106-54 to support former House Speaker Marco Rubio in the U.S. Senate primary. Monday night’s straw poll was the 11th conducted by a county Republican committee and Rubio has won them all. The fact that Crist lost in Pinellas County, which he represented in the state Senate and where he’s lived nearly all his life, can’t be a good sign for Crist." Posted by Bill Smith : Post Link --> 12:00 AM 0 Comments - Share Yours! Tags: AARP, ARRA News Service, dirty secret, government healthcare, kickbacks, liberals, medicare, royalties, seniors To share or post to your site, click on "Post Link". Please mention / link to America's Best Choice. Thanks! Posted by Bill Smith : Post Link --> 4:13 PM 0 Comments - Share Yours! Deerfield Beach, FL - Florida Republican Congressional Candidate Allen West today called the backroom negotiations over healthcare "a flagrant disregard of the trust of the American people." West called on his opponent, Representative Ron Klein, to demand the negotiations be made public or announce he will vote against the bill. "Our Republic depends on openness, on our citizens being able to learn about legislation and make their thoughts known to Members of Congress," West stated in an email sent to his supporters today. "No Member of Congress should support a bill whose details are unknown to the public." West called for grassroots activists to contact Congress and demand open hearings on the healthcare bill. 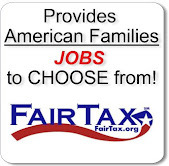 "This is not representative government, it is a flagrant disregard of the trust of the American people," West stated. "The only word to describe what Representative Klein's boss, Nancy Pelosi, is doing is nefarious. Our Republic stands upon a simple premise called the rule of law; this is completely the antithesis of that principle". Once again the liberals in Congress are taking action that threatens our Liberty. Even worse, now they are negotiating the final important details of the healthcare takeover behind closed doors. This is nothing less than a flagrant disregard of the trust of the American people. Our Republic depends on openness, on our citizens being able to learn about legislation and making their thoughts known to Members of Congress. This week, Brian Lamb of C-SPAN wrote to Speaker Nancy Pelosi and Senator Harry Reid. Lamb and C-SPAN offered to put the entire backroom deal making on TV. So far, neither Reid nor Pelosi have agreed to have the public watch as the liberals plot to enact a government run healthcare system. We need to take action now. I need you to do the following three action items to let Congress know we expect them to conduct business in the open where we can view the proceedings. Email or call either Speaker Pelosi ( AmericanVoices@mail.house.gov or 202-225-0100 ) or Senator Reid reid.senate.gov/contact or 202-224-3542 ) and tell them to make the health care negotiations public. Call my opponent Ron Klein (866-713-7303). Ask Congressman Klein to call for open meetings or to announce he will oppose any health care deal completed behind closed doors. No Member of Congress should support a bill whose details are unknown to the public. Forward this email to at least five of your friends. Together we can bring the liberals out in the open and expose their plan to put the government in charge of your health care. Posted by Bill Smith : Post Link --> 3:00 PM 0 Comments - Share Yours! Tags: AARP, dirty secret, government healthcare, kickbacks, medicare, royalties, seniors To share or post to your site, click on "Post Link". Please mention / link to America's Best Choice. Thanks! Posted by Bill Smith : Post Link --> 10:21 PM 1 Comments - Share Yours! That's right, the land of Martha's Vineyard, Ted Kennedy, and Barney Frank may hold the key to stopping the runaway train to Socialism that we've been trying to derail for months! On January 19, there will be a special election to fill the seat vacated by Senator Kennedy's death. Without this seat, the Obama-Pelosi-Reid agenda will fall flat on its face because the Socialists in DC will no longer be able to overcome a Republican filibuster. Here's a press release from Conservative Solutions on Facebook that lays out a plan for winning the first battle of 2010! It's not faxes. It's not rallies. It is Scott Brown for US Senate in 15 days!!! Also, if you have $5, 10, $25, $50 or whatever you can spare, please sign up to donate to the Brown Campaign on January 11. We've been fighting a war against our way of life for almost a year now. Here is an opportunity to deal the enemy a decisive blow, and possibly win the war. And it's a simple two step plan that can be implemented by anyone, anywhere in the US. Posted by John M. Allison III : Post Link --> 1:35 PM 0 Comments - Share Yours! Tags: 2010 Elections, ARRA News Service, children, National Debt To share or post to your site, click on "Post Link". Please mention / link to America's Best Choice. Thanks! Posted by Bill Smith : Post Link --> 6:34 PM 0 Comments - Share Yours! 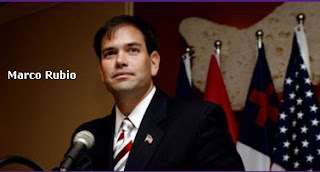 Adam C. Smith, St Petersburg Times Political Editor offers some interesting end of year considerations on the Rubio - Christ race in Florida for the US Senate: Welcome to 2010, which stands to be the busiest and most unpredictable political year Florida has seen in decades. . . . Winner of 2009: Marco Rubio Eight months ago, even some of his biggest admirers were calling him crazy and shortsighted. Why in world would he launch a futile U.S. Senate campaign against an immensely popular sitting governor sure to raise vast amounts of money? Give it up, and the attorney general's nomination would be all his, and he'd be poised from there to run for Senate or governor. Instead, Rubio stuck to it. He courted national conservative media attention and excited hard-core activists, while Tea Party protesters became a growing force and Crist steadily looked more and more vulnerable. Today, Marco Rubio vs. Charlie Crist is among the marquee races across the country. Loser of 2009: Charlie Crist The governor's uncanny political instincts used to be taken as an article of faith, but they seem to have disappeared in 2009. He's in real trouble at the opening of 2010, but nobody should count him out. Political predictions. . . [We'll just have to see] [However] Pat Shortridge, senior adviser to the Rubio campaign, predicts soon from Crist: "A lot of wild punches. And early negative advertising. And mudslinging mail. And anonymous Web sites. All repeated ad nauseam. So be forewarned. It's coming. Very, very soon," he wrote in an e-mail to supporters. Indeed, Crist can't afford to keep watching Rubio's poll numbers climb, and he has the money to inflict real damage on the Miami Republican with an aggressive negative assault. At the same time, Crist's nice guy persona would take a serious hit, and he could provoke Jeb Bush to rise up to Rubio's defense. Former Gov. Bush is officially neutral, but that may not last all that long. His sons, Jeb Jr. and George P., are planning to host a Rubio fundraiser in Miami this month. Posted by Bill Smith : Post Link --> 6:14 PM 2 Comments - Share Yours! by John Allison III, at America, You Asked For It! After Harry Reid and his 59 cronies in the US Senate voted on Christmas Eve to cut Medicare and tax health care benefits of the American middle class, President Obama proudly exclaimed the vote is moving us "toward the end of a nearly century-long struggle" and that the bill "includes the toughest measures ever taken to hold the insurance industry accountable." But last year an Obama campaign ad blasted Senator John McCain (R-AZ) for proposing what the President is now praising in Reid's health care bill. Yes, we have the proof because the President's political hacks failed to seek out and destroy the evidence! The President's campaign ad may not live long on YouTube if recent history is any guide. So view it while you can. The first video is Obama's original campaign ad that slams John McCain for proposing to pay for health care reform by taxing health care benefits and cutting Medicare--both of which are contained in Reid's health care bill Obama seems so giddy about now. The video below is an edited version of the campaign ad that was adapted to target Reid's bill. Posted by John M. Allison III : Post Link --> 1:08 PM 0 Comments - Share Yours!